The wedding is a big event in everyone’s life. The planning of wedding begins nearly one year earlier. 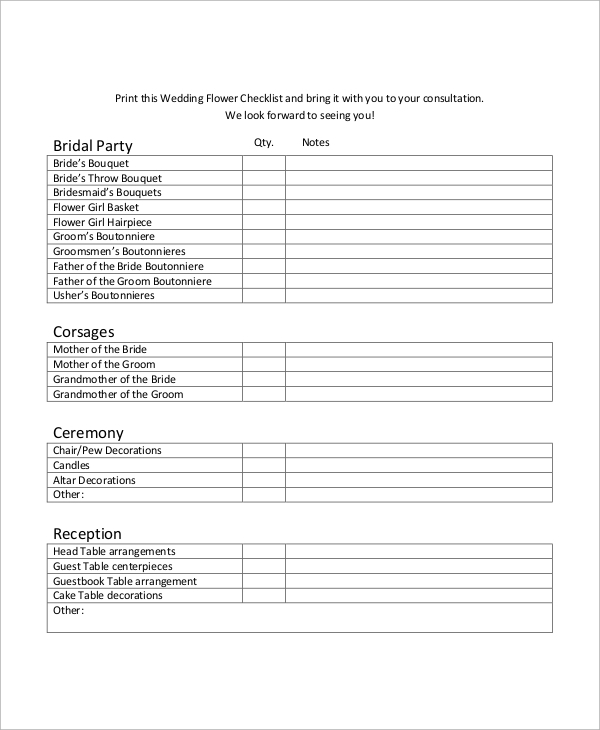 The following wedding checklists printable are perfect from all aspects, and they will help to carry out all the activities associated with wedding smoothly. There are Sample Checklists for wedding flower planning, wedding photography planning, wedding stationery planning, and likewise. 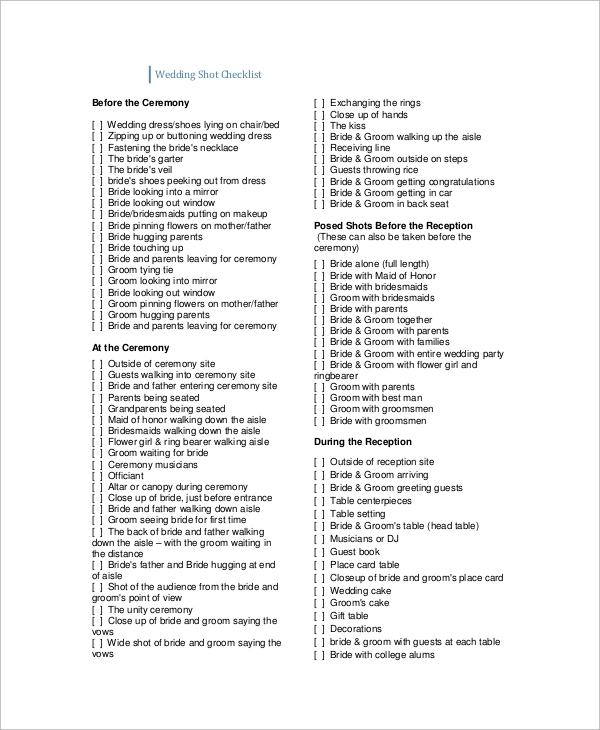 Some checklists also help to carry out the activities during the wedding day and reception day with a timeline format. 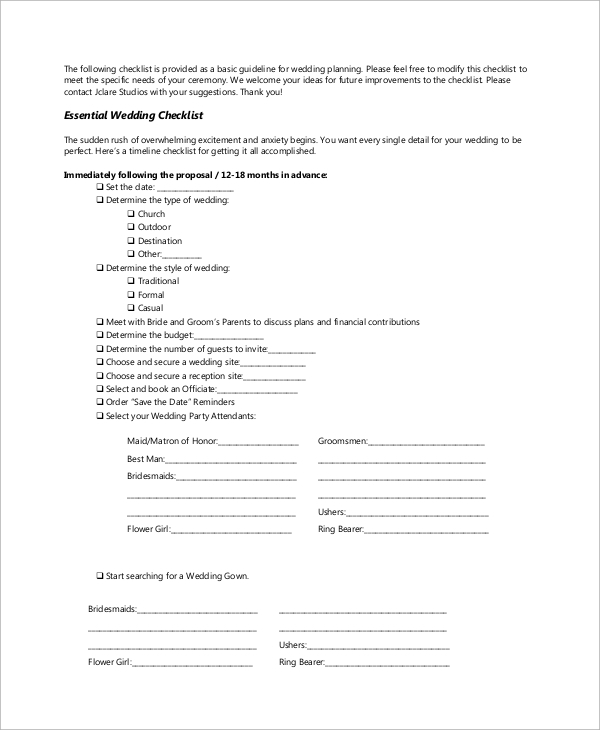 This is a complete Sample Wedding Checklist for wedding flower. It has provisions for the bridal party, corsages, ceremony and reception. Under each provision, there are items and spaces for writing special notes and quantities. 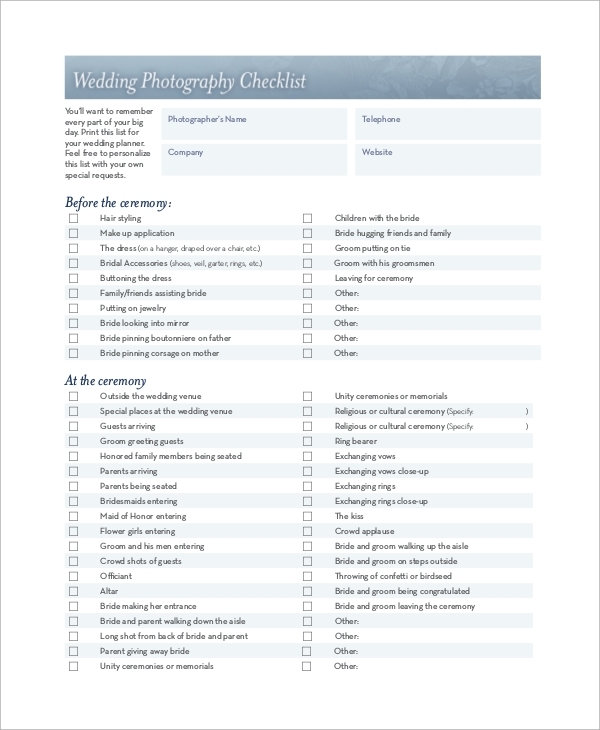 This is a complete Wedding Planning Checklist, and it is in the form of a timeline along with necessary categories under which the items are listed. It mentions the things to buy a few months before the wedding, a few weeks before the wedding and after the wedding. 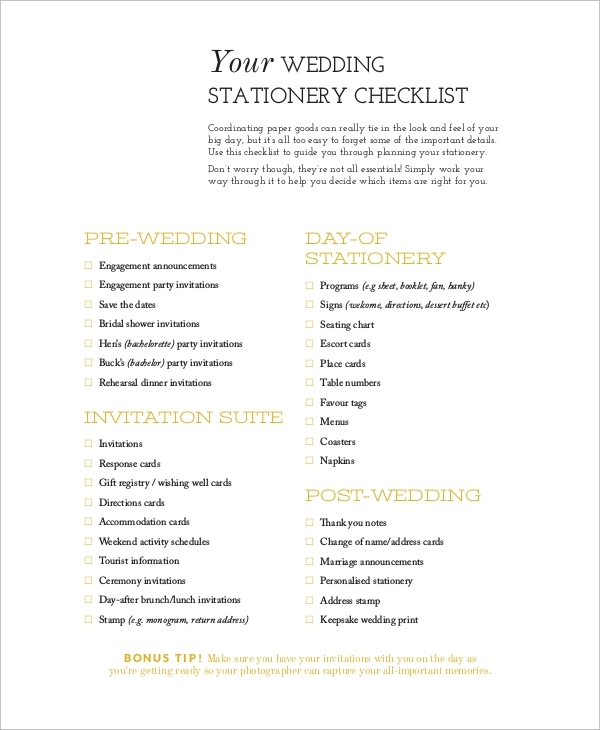 This is a perfect wedding stationery checklist containing the things to buy before wedding including clothes and items for interesting activities. There is a list of stationery to buy after weddings such as thank you notes and personalized stationery. 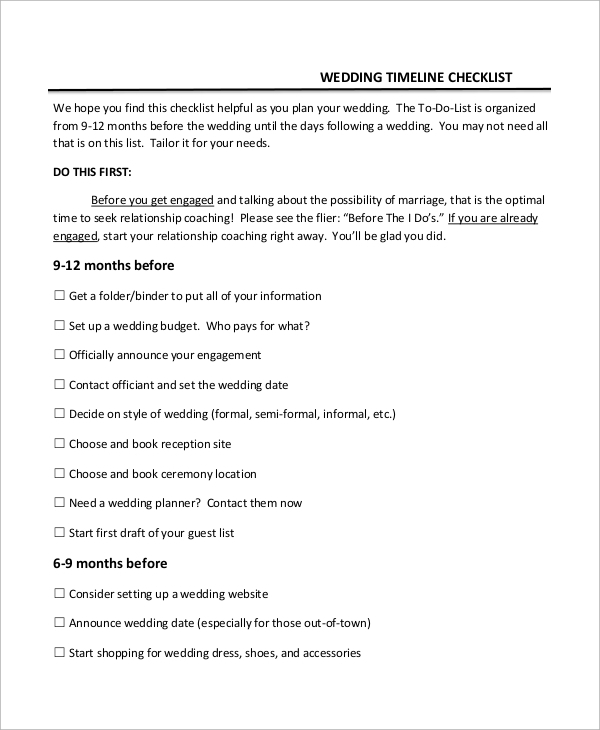 The Wedding Planner Checklist Samples are printable, and they are in timeline formats to remind everyone of things to do weeks and months before the wedding, on the day of the wedding as well as after the wedding. It takes away the headache of forgetting something vital. There are lists of activities, items to buy, timely tasks to do to make the event grand. There are activity checklists for things to do on the wedding day and reception day such as taking care of guests, who are the chief guests and there are spaces for writing special notes. 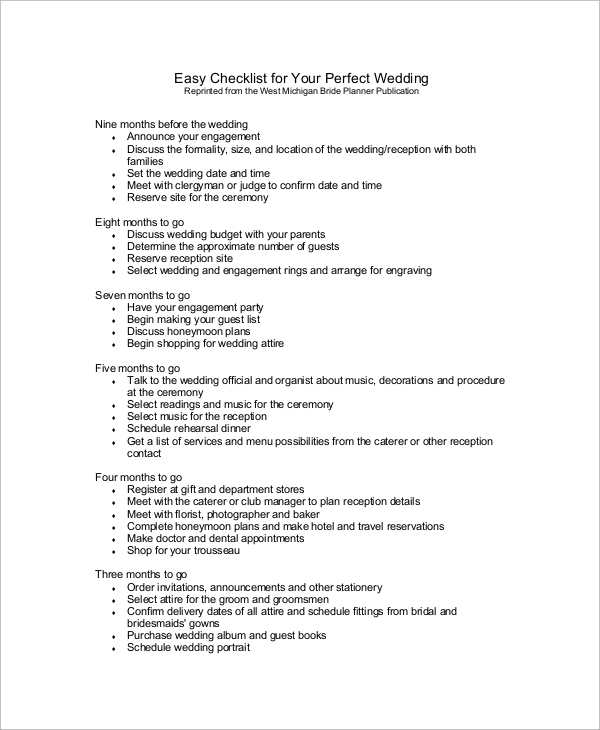 This is a To-Do Checklist for a wedding, and the things to do are categorized according to wedding timeline. There are categories of things to do every month starting from one year before to the wedding month and weeks. There are also checklists for things to do a day before the wedding, on the wedding day and the day after. This is a vital checklist for things to do on the wedding day. It mentions the things to do before the ceremony, at the ceremony, before the reception, during the reception. It also has a provision to write the special guest list and take proper care of them. 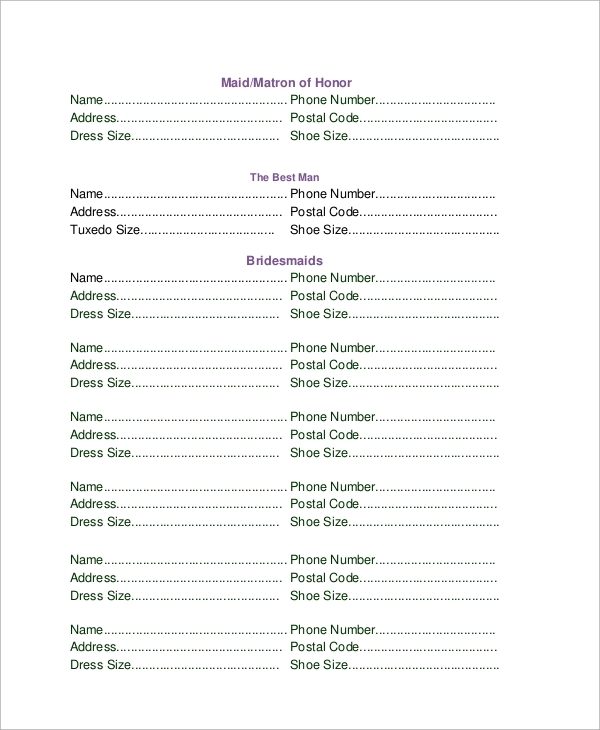 The targeted audiences for Wedding Checklist PDF Samples are the guys and girls who are getting ready for the wedding and their associated people like friends, parents, and neighbors. 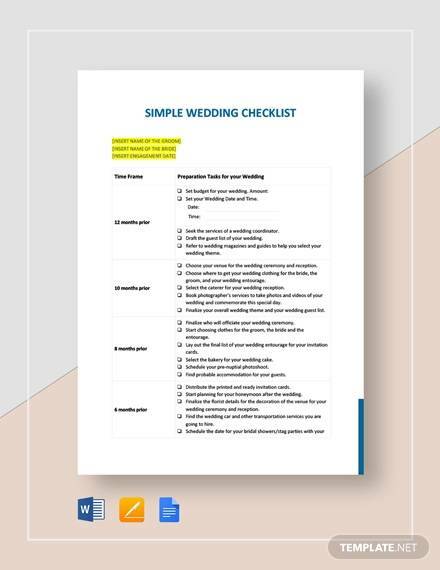 During a wedding, responsibilities are shared, and the above-listed sample checklists will help to carry out activities smoothly without forgetting a single thing. There are also useful for the agencies who take the contract to conduct a wedding ceremony and to make it look grand. 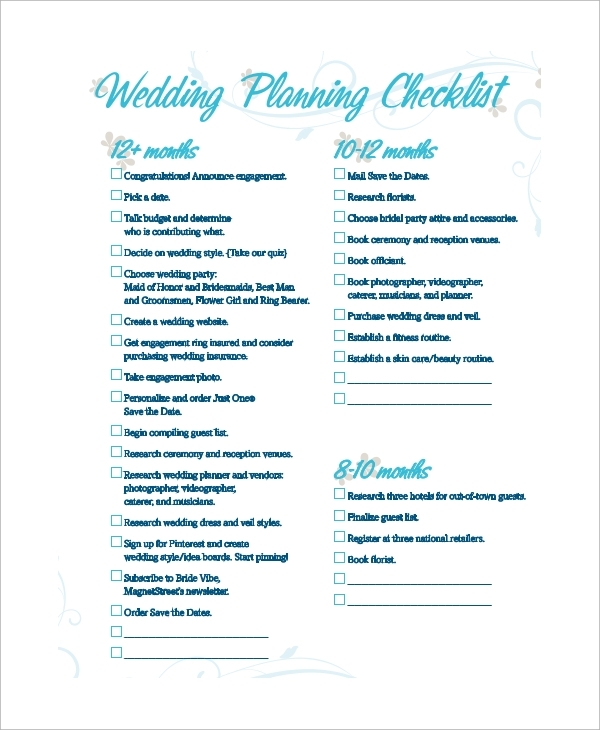 The above-listed wedding planner Checklist Samples are useful for everyone who is getting ready for the wedding. 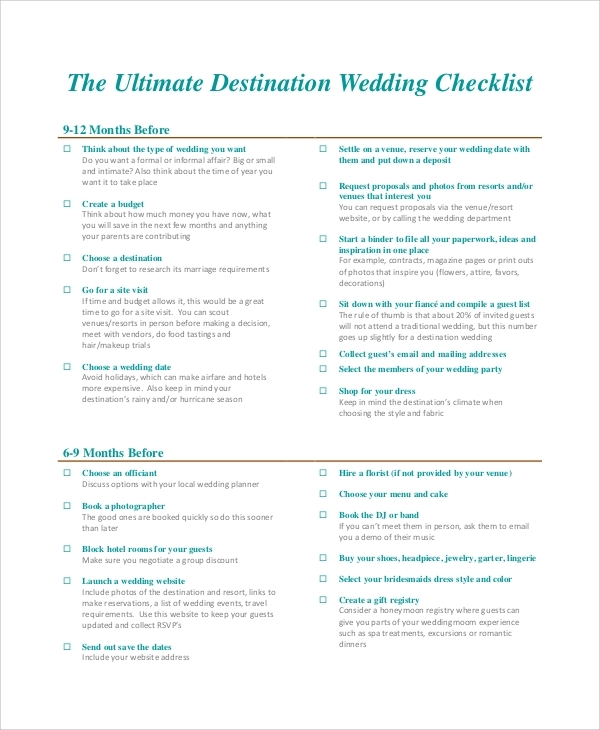 There are timeline checklists which help to remind the associated people of the activities to perform and the things to buy months and weeks before wedding day. There is not a single thing that you will miss if you choose to use them and the event will take place smoothly without any last minute panic.